When clearing out my desk I found this old Doctor Who Christmas card from my girlfriend. I recognise some of the newer Doctor Who characters but others have completely baffled me. Can anyone help me identify them? Front row: The Ninth Doctor holding some Adipose, a Weeping Angel, the Tenth Doctor, a Dalek, the 12th Doctor, a Silent and the Second Doctor. Second Row: The Master, (with K-9 in behind), the Eleventhth Doctor, one of the gas-masked duplicates from "The Doctor Lives", a Cyberman, the Eighth Doctor, a Sontaran dancing in front of him, the Seventh Doctor and the Fourth Doctor. 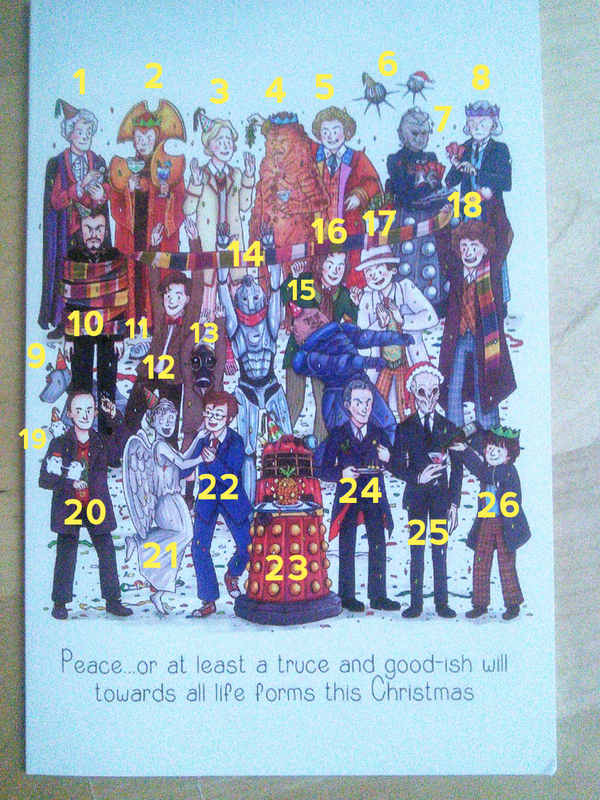 Third Row: The Third Doctor, a Time Lord, the Fifth Doctor, a Zygon, the Sixth Doctor, Davros, and the First Doctor. Not the answer you're looking for? Browse other questions tagged doctor-who character-identification or ask your own question. Is “Doctor who” actually uttered less frequently than variations on the phrase? Do we already know how the Doctor gets his bodies or faces? Is there an official list of Doctor Who Companions? Why did the Doctor give River his screwdriver? Why would the Doctor get his tie?